RMG is turning up the heat on our competition this summer with the 1.4 update to Korbyt, our enterprise-class CMS platform. With a so many new and enhanced features, it’s just not practical to list them all in this one short article. 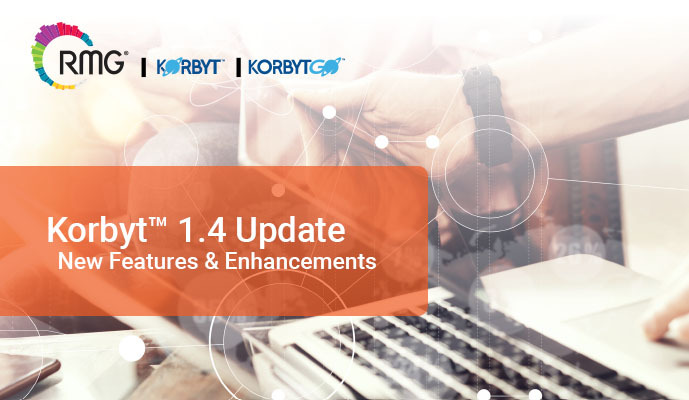 So, let’s forget the decimal in 1.4 and focus on the 14 most exciting features added in this update that make using Korbyt easier and more efficient for our clients. To cut down on the number of clicks to save time, we’ve added even more drag and drop functionality. Drag files directly to Media Library, Media Players, Player Groups and Playlists. Korbyt now supports video wall display spanning and file replication with BrightSign players using a new sync feature. This new feature provides users with a calendar view of scheduled player content to easily determine what is scheduled across a network. User permissions are extended to player groups and media library folders, allowing Tenant Administrators to better protect content publishing and simplify workflows for content publishers and authors. For Tenant Admin and Admin user roles, a new user interface makes adding permissions to media library folders easy. Admin users may now grant or restrict access to media library folders based on the admin user, protecting content from accidental deletion or from prying eyes. New usability enhancements including double-click to edit elements, ruler guides and keyboard shortcuts, making designing and editing Layout templates even easier. Quickly create charts, graphs and gauges using a new drag and drop element in the Layouts and Messages toolbar. A new drag and drop element allows customers to easily add YouTube videos and channels to their Korbyt Layouts. On-Premises and Hybrid Korbyt clients will now be able to start or schedule Korbyt upgrades through the user interface. KorbytGO gets a face-lift with updated layouts on user-generated posts, the change password page, Player Push app, Media Push app, Chat app and updates to all pop-up messages. KorbytGO now features a built-in directory app that allows employees to quickly search, find and contact colleagues by phone or email. A new feature allows KorbytGO admin users to designate newsfeed posts as shareable for social media. This empowers employees to be your businesses’ greatest advocates by sharing company updates on personal social media profiles. Across the Korbyt admin portal, new and enhanced features like warnings on deleting content in use, email reminders for expiring content and deep linking between objects to reduce clicks make the user experience better and more efficient for Korbyt clients. See the complete list of new features and enhancements in our What’s New in 1.4 FAQ!